111-year-old Tugboat Urger Will Be Open for Public Visits Waterford, N.Y. - One of the oldest working tugboats in America will join the Waterford Tugboat Roundup September 7-8-9, the New York State Canal Corporation announced. The tugboat Urger will be docked at the Waterford Harbor Visitors Center, where the Mohawk River meets the Hudson River. The Urger will be open for public tours from 9 a.m. to 2 p.m. Saturday, and from 10 a.m. to 2 p.m. Sunday. The Visitors Center is at One Tugboat Alley Waterford, New York 12188. 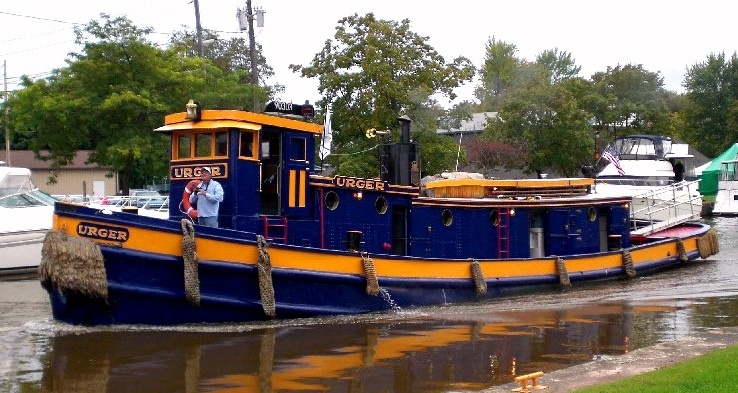 On Friday, September 7, the Urger will lead the "tugboat parade" from the Port of Albany to Waterford Harbor. Launched in 1901 and listed on the National Historic Register, the Urger has served as the Canals flagship and floating classroom since 1991. Howard P. Milstein, Chairman of the New York State Thruway Authority and Canal Corporation, said, "The Urger is an enduring symbol of the rich history of the Erie Canal, and one of our greatest ambassador for promoting tourism along this vibrant, scenic waterway. We are proud to share this iconic vessel and her compelling history with visitors and residents." Brian U. Stratton, Director of the New York State Canal Corporation, said, "The Urger helps us celebrate the legacy of visionary New Yorkers like DeWitt Clinton, while promoting today&apos;s Canal as a fun, unique recreation destination for visitors from around the state, and around the world." Capt. Wendy Marble, the skipper of the Urger, said. "The Urger&apos;s principal mission is to serve as a floating classroom to familiarize school children with the history of New York&apos;s Canal system. We welcome these occasions when we can open up the boat to the general public to experience a bit of Canal history first-hand in an engaging way." Originally called the Henry J. Dornbos, the Urger was launched in 1901 at the Johnston Brothers Shipyard in Ferrysburg, Mich., and was operated by the Verduin family on Lake Michigan for 20 years. Because of her seaworthiness, the vessel occasionally was called into service for rescues on the lake by the U.S. Lifesaving Service, a forerunner of the U.S. Coast Guard. In 1922, the vessel - re-christened with the eponymous name Urger in recognition of her new mission - entered into service in New York as a maintenance tugboat on the recently completed Barge Canal, "urging" scows and barges along in conjunction with dredging and other maintenance activities. She remained in active, everyday operation until 1986 when she was retired from her regular maintenance duties. In 1991, the Urger began a new chapter as a floating museum and classroom. For the last two decades, the Urger has been the setting for programs to educate fourth graders about the importance of New York&apos;s historic Canal system and the role that it played in the state&apos;s economic and social development. More than 100,000 school children have gone aboard the Urger during this time, and disembarked with a renewed sense of the Erie Canal&apos;s legacy. For more information about the 2012 Waterford Tugboat Roundup, please see http://www.tugboatroundup.com/ . The New York State Canal System is comprised of four historic waterways, the Erie, the Champlain, the Oswego and the Cayuga-Seneca Canals. Spanning 524 miles across New York State, the waterways link the Hudson River, Lake Champlain, Lake Ontario, the Finger Lakes and Lake Erie via the Niagara River with communities rich in history and culture. For more information the New York State Canal System, please call 1-800-4CANAL4 or visit http://www.nyscanals.gov/ .